Oh it’s the first of his 3 new apps by “Mr Quantum” Antony Saunders, you know your buying quality so yes instant purchase. No hanging notes during my tests, works allright and is fun to use. There are 15 presets, none using the rythmic echo feature. There is one anoying thing - the knobs are extreme sensitive and dialing in values is a pita. The method seems to be circular, but as soon as you touch the knob you don’t pick up the old value but start with the value defined by the angle to the center - touching near the center therefore results in unpredictable jumpy starting values. If you want for instance to change a 9 into a 10, you need to know the angle for the value 9, touch the knob in this direction from its center and do a circular motion right to dial in the 10. By touching and moving the finder just on the knob, one often jumps between beeing left or right of the center resulting in big value jumps. Currently the best way to dial in values seems to be to touch the knob and then move the finger as far away as possible (still touching) in the direction you want the value to be, then do a big circle far away around the knob and you get enough precision to dial in the value you wanted. Especially the tempo value in msec is critical. I think we may need a video for this one, as it’s not a audio effect but midi effect app so it’s not obvious to get results. If you tap on the app as a standalone it gives you instructions PDF. Had a slitch glitch using Rozeta particles driving Sunrizer and Midi echo in the mix my cpu hit 103 in AUM! @_ki Agreed the knobs are over sensitive and jump around a bit. I still can’t get any sort of echo effect by using this so definitely need a video tutorial or screenshot at least to set this up properly. Open up the standalone app and you get the manual. I will provide a link to an online version. I had no idea (or would have guessed) that midi echo shows its manual when started as standalone - i especially like that i can copy the pdf to iBooks, where i store all my audii app manuals. BTW: This setting is not mentioned in the manual, i found it on the iPads settings under the settings for Midi Echo AU. Ok I admit had a bit of a midiot moment in AUM as had AUM internal keyboard set up under the synth I was trying to control rather than selecting the keyboard under Midi Echo AU all makes sense now DOH ! @_ki like your idea of L/R sensitivity being lower than U/D. 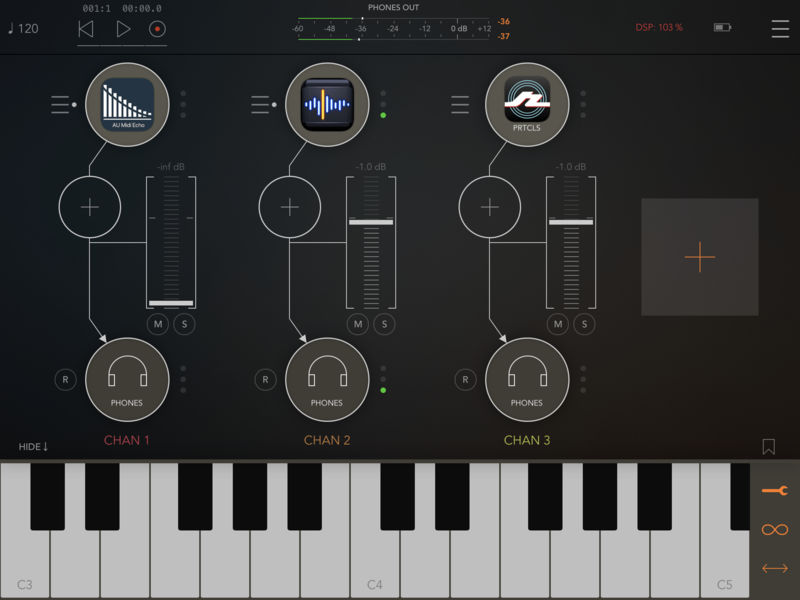 Good to see another AU midi effect app being created there are not a lot on the market at present. Few scaling problems on my iPhone SE which is always a devs challenge! One's that seem like they should be quite straight forward on the face of it. Velocity Compressor/Expander - Used to even out or stretch out velocity over notes, and to be able to raise/lower velocity in general, having compression amount and level controllable via CC. This would mainly be used for 'improving' a recorded midi performance from a keyboard. Timing/velocity wobbler - move the timing of notes back and forth by small amounts (adjustable) and also the velocity up/down by small amounts (also controllable) this would mainly be used as a humaniser on programmed midi to give it a more natural feeling the amount should be cc controlable to allow for tightening/loosening timing while MIDI is playing. Note length modifier - Use note in from incoming MIDI, but ignore note out and create note out based on controllable setting for note length, I guess like a note off quantiser but the length is adjustable while it is playing. Used to turn Legato into staccato and staccato into legato in realtime. Timing Doubler/Halver - Either halve or double the MIDI timing of incoming midi without adjusting the BPM of the track, quite often something is programmed at one speed, but played back much slower/faster, resulting in BPM setting of double/half what the actual BPM is, this is usually fine in a MIDI only system, but when you have Link and samples involved then it becomes a pain, and it is not easy to adjust the playback speed in most MIDI editors. The compressor would be similar to Quantum fx Compress - infact I aim to bring all of the other 7 to life as AUv3 midi - as well as a lot of generative sequence midi apps. The timing/velocity wobbler sounds like a quantizer for either timing or velocity. I have this already for the recording app (including strength for time or vel) but would be interesting to apply a 'groove' to live midi! if you consider start time, velocity, duration as individually quantizable. The timing one again sounds like a recording app function - you record your midi then shrink/enlarge it. @midiSequencer - thanks for this cool app. Fiddled around with it on AUM controlling pitch of the Midi Echo with Rozetta LFO just as a test - quite trippy! I look forward to these arriving then. Hmm yeah quantize for some uses, but I am thinking about real-time control, like a gate control on a step sequencer but useable on piano roll recorded midi, so you can have a pattern playing staccato, then over time increase the note length so it becomes legato as it plays. You would get a similar effect to if you increased/decreased release time on a synth with short decay and 0 sustain, but be able to use it on sound sources that only have a gate and no envelope. An example of a real world use would be, if you have a sample player that has no envelope, and plays the sample for as long as the note is held...load an open hat sound that rings.....use short notes to get closed hat, longer notes for open hat, modulate the note length to swap between the two. Yeah this is more of a utility to be applied offline and not in real time, time stretch for MIDI parts I guess. 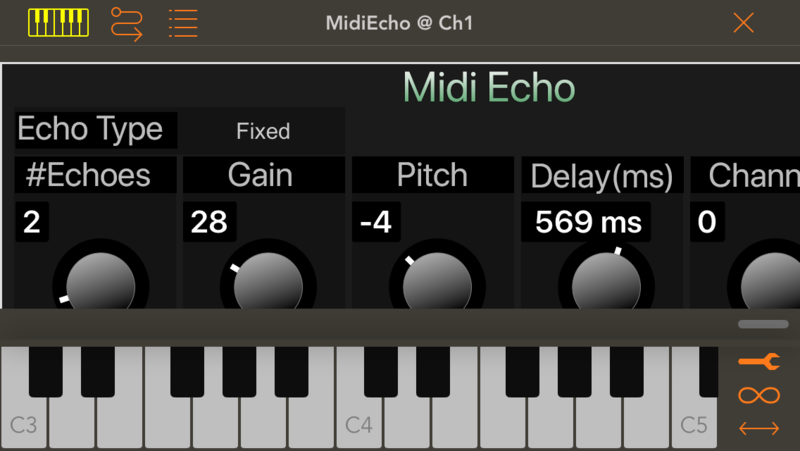 Nice, i need a midi echo for iOS. Not sure from the description and GUI....Can i set a crescendo or decresendo for the echos. So kind of decay/reversed decay? Edit: From the manual it seems it can. seems not - so will allow gain to go to 200% or see if taper does this. yes having AU Parameters exposed is a great way to automate. Just stay away from delay time at the moment - I tried to use one parameter to control two things (tempo & delay time) - it needs to be two separate AU Parms - so making that change now.